Rings? What if the the hawk is bringing them? 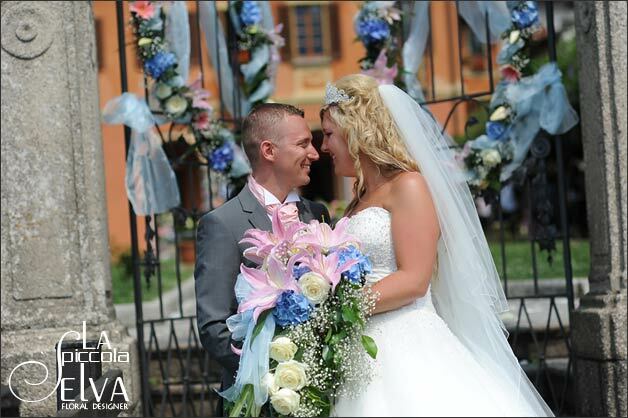 illa Bossi is no doubt one of the most beautiful wedding destination for a civil ceremony in Italy. 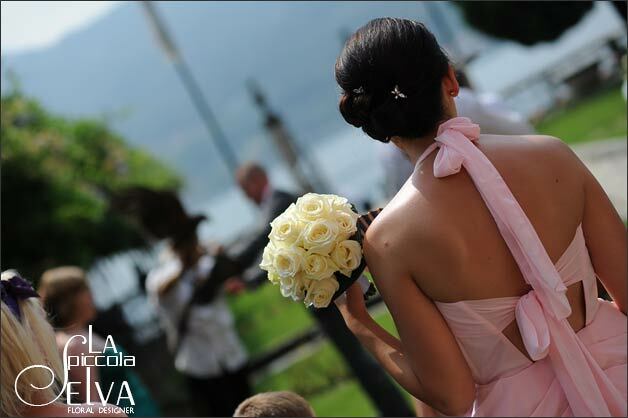 As floral designer for weddings on Lake Orta I worked many times at Villa Bossi. Some weddings decorations were simple and some were more complex and challenging. 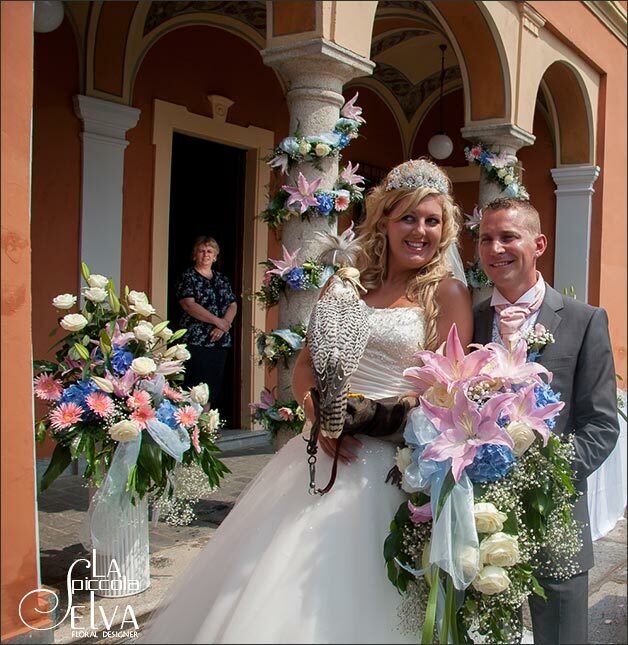 Anyway I keep a special memory of all weddings I decorated at Villa Bossi. Anyway there are some that are so special that left a very special memory in my heart. 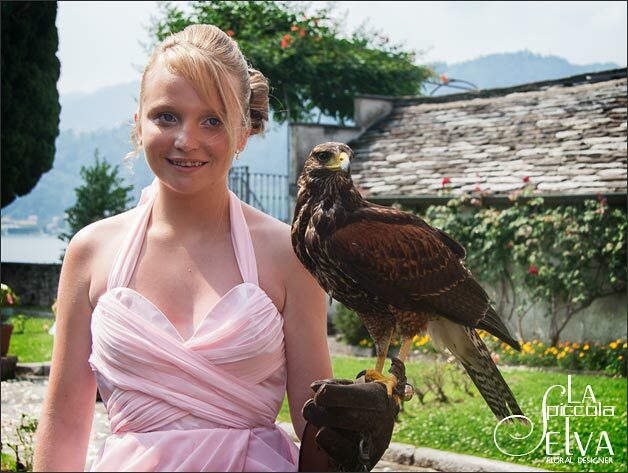 And not only in mine but also in musicians, photographers, wedding planners, boat men, celebrant and… falconer’s one! Just read below. This is all about Maddalena and Carl’s wedding. Maddalena and Carl came from UK. As floral designer I met them thanks to Alessandra Garbagnati the wedding planner from Boutique Weddings that I want to thank for the great collaboration and for sharing lovely images on this post. 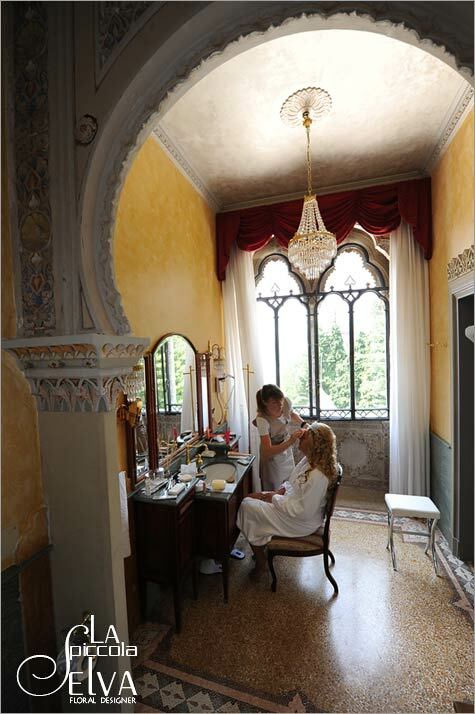 Maddalena is a joyful girl and she had a dream: being a princess for a day! 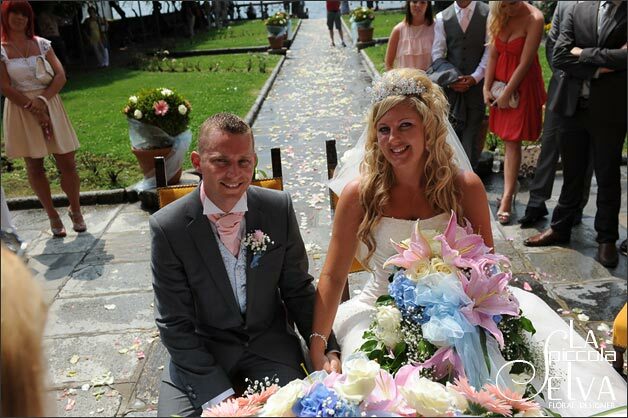 To make her dream come true she chose Lake Orta! We were all proud of it! I met this lovely couple 6 months before the wedding and Maddalena explained carefully her wishes. 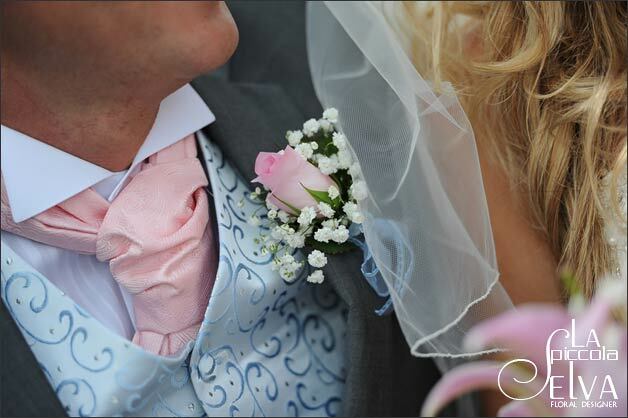 As a princess she had a fairy tale wedding gown and fairy tale colour shame: pink, white and light blue. Classical princess colors! And what about the reception venue? Villa Crespi of course! A fairy tale venue for sure! 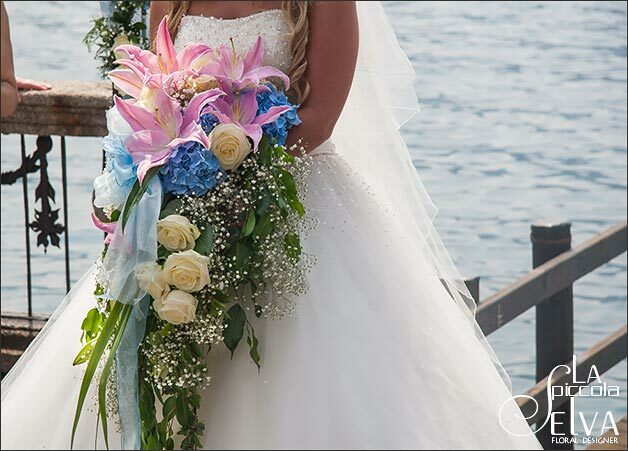 We could not forget about other fairy tale details such as a huge bouquet with Avalanche roses, light blue hydrangea and Casablanca pink lilium. One of the biggest bouquet I ever did in my career. 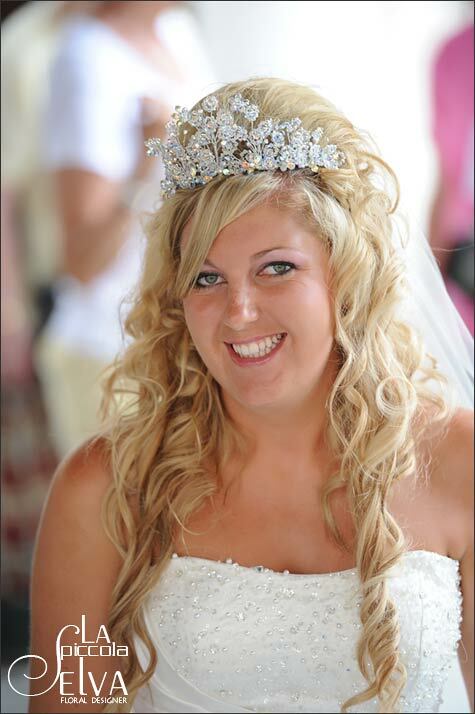 Maddalena’s wide bridal dress made her seem a real princess such as the sparkling tiara on her veil and the three young bridesmaids following her. And the rings? Hawk is bringing them! And as final touch, the one that made the wedding just unforgettable: the rings were brought by a wonderful hawk! Just imagine the scene. 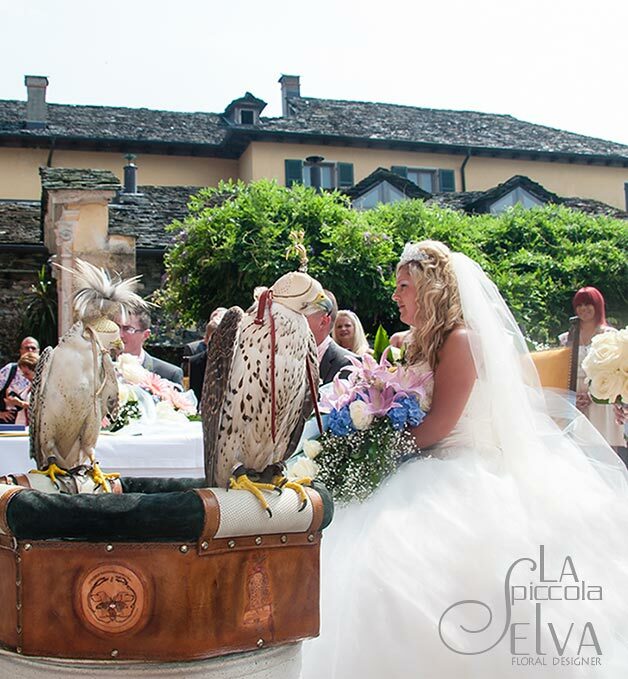 Hawk is flying over the sky of Villa Bossi and after some circles above the guests, it glided on bride and groom to give them their wedding rings. Oh what a fairy tale! 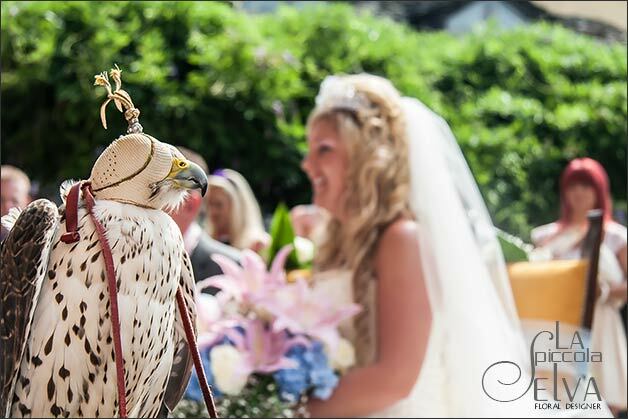 The idea of the hawk bringing the wedding rings was an inspiration taken by a VIP British wedding. Manchester soccer player Rio Ferdinand and Rebecca Ellison’s wedding. 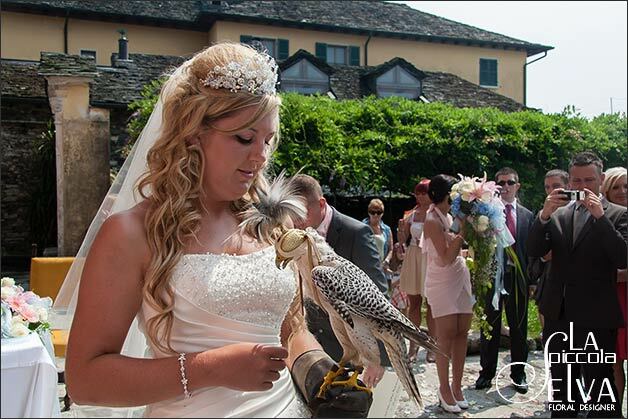 A big white owl glided over Peckforton Castle to bring the rings to the couple. 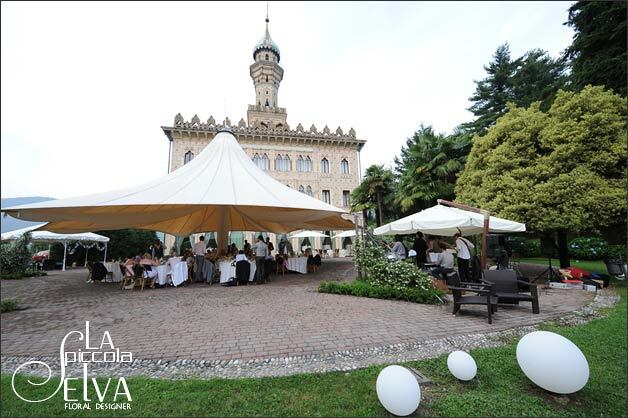 The event at Villa Bossi was studied in every detail. 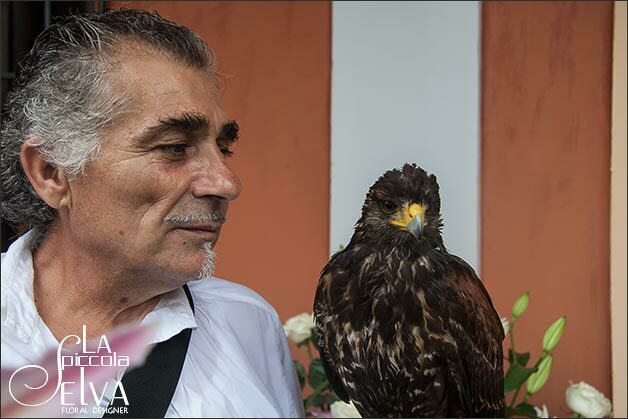 A team of falconers came from Como with three hawks. One of them was white and just wonderful! 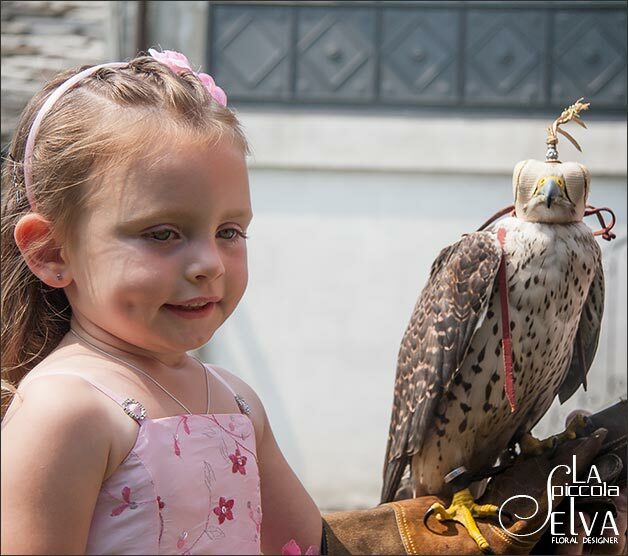 The three birds become easily the main attraction for all guests and most of all among children present! They all wanted a picture with these wonderful animals. 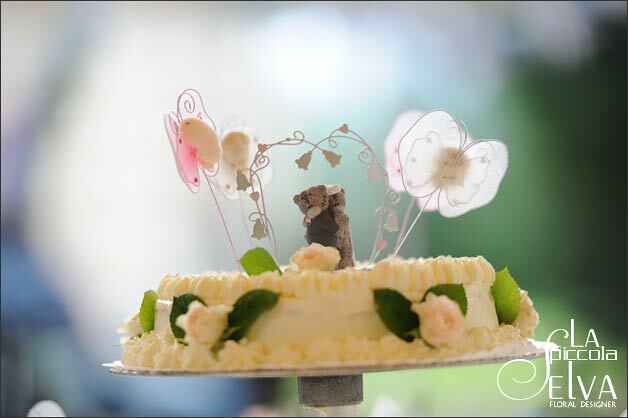 Last but not least let me speak about floral decoration too! With the stars of the day bride and groom of course and their special guests… the hawks, I would love to remember the big compositions I did for the important spots at Villa Bossi. They really create a wow factor for the ceremony! After their civil ceremony at Villa Bossi, bride and groom had a lovely motorboat tour to St. Julius Island. Have a look to this lovely shot where kids on a school trips greet joyfully Maddalena and Carl! As I mentioned above a fairy tale ceremony has to be followed by a fairy tale reception too! It was planned at Villa Crespi. 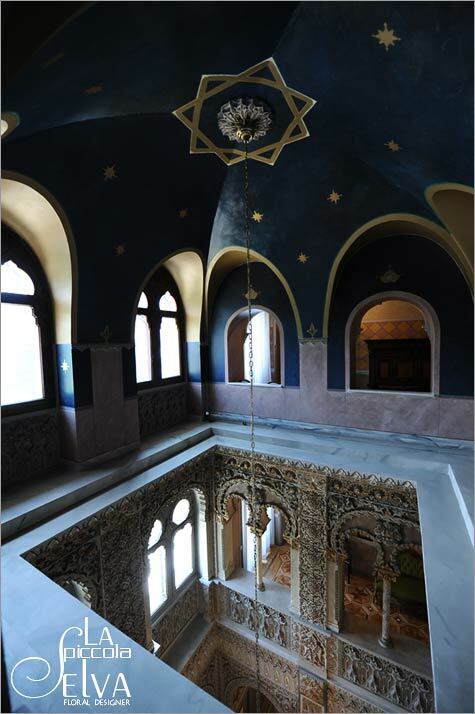 This is a very special venue for the ones that really want to feel a queen and a king for a day! Just as in Arabian Nights tales. A welcome cocktail and dinner to follow outdoor in the gardens of Villa Crespi. Just amazing! 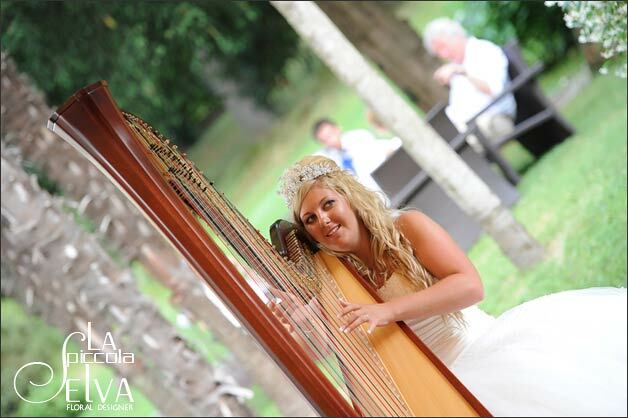 An antique atmosphere created by the sound of an harp… just like in a real princess fairy tale. 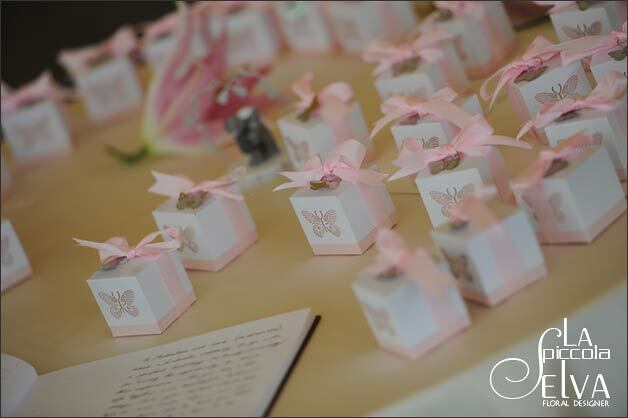 On the table there were little butterflies themed favours just like the wedding cake. 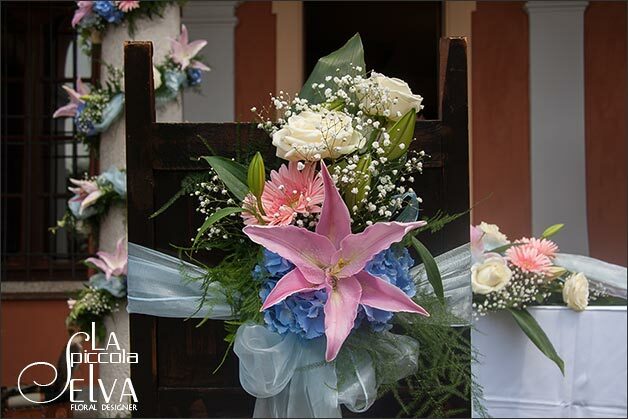 Just like I did for the decorations to Villa Bossi, for the centerpieces at Villa Crespi Maddalena wanted a fairy tale theme with the colours of white, pink and light blue. 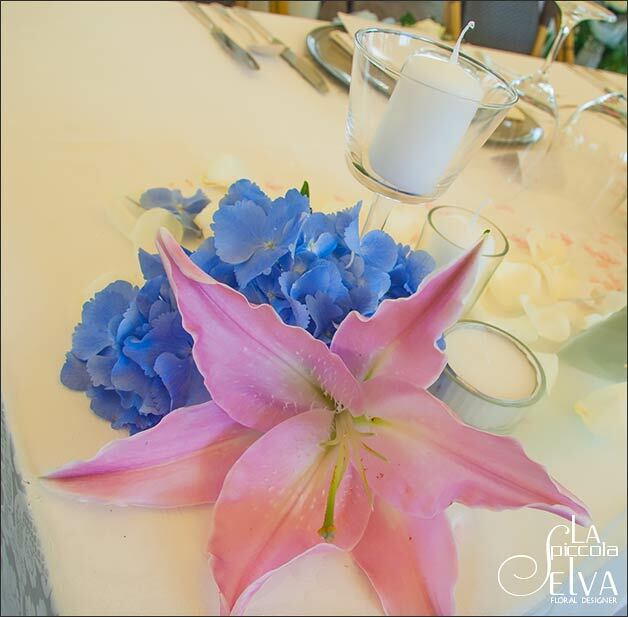 For the tables of the reception I created big round shaped centerpieces with a vase and a candle in the middle. 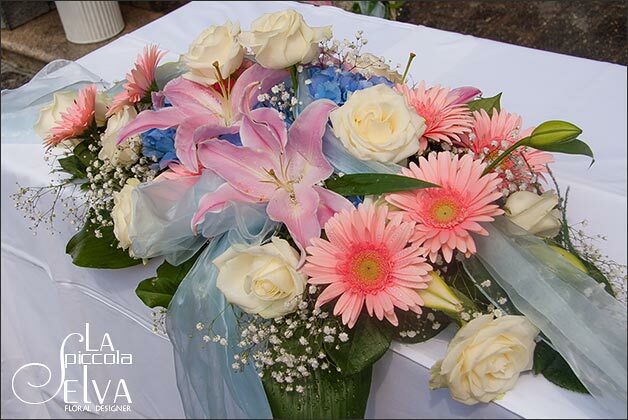 Around that gerberas, light blue hydrageas, and Casablanca pink lilies. 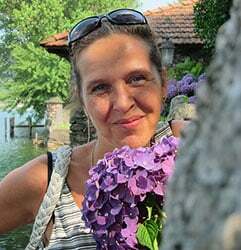 Monika Andenmatten is La Piccola Selva’s floral designer. 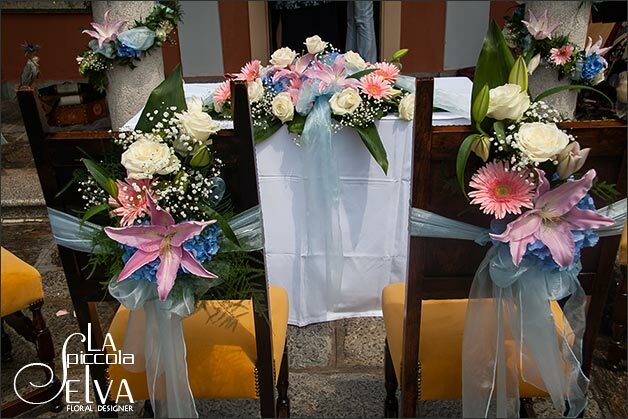 Based in lake Orta, has worked with brides for over 20 years to create floral arrangements for weddings in the Italian Lakes district. 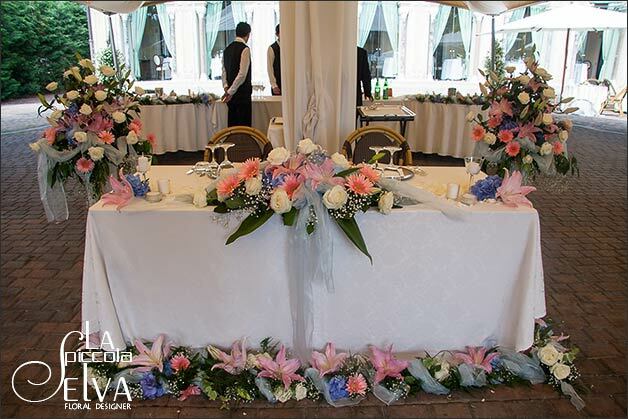 His wedding arrangements are creative, elegant and sophisticated. 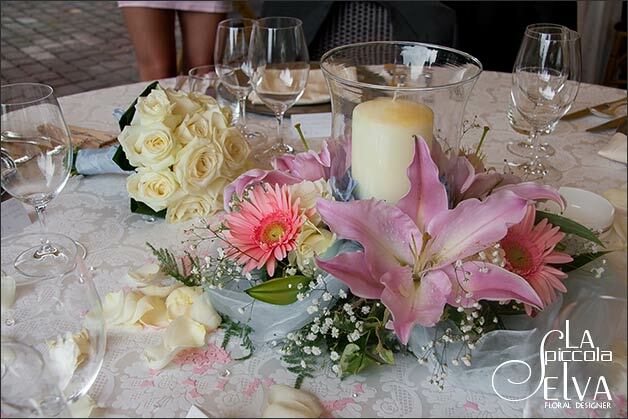 Monika will be able to help you choose how best to incorporate floral design into your wedding celebrations. 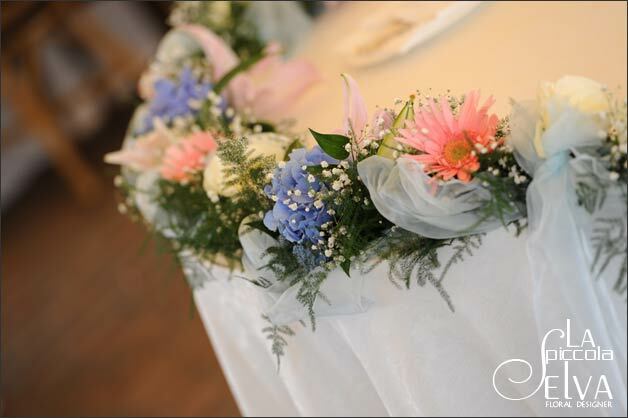 From the initial consultation to the wedding day, she will make your wedding flowers truly an expression of your dreams. The graceful hawk’s glide on Villa Bossi bringing the wedding rings for Maddalena and Carl will be one of the event we will never forget! 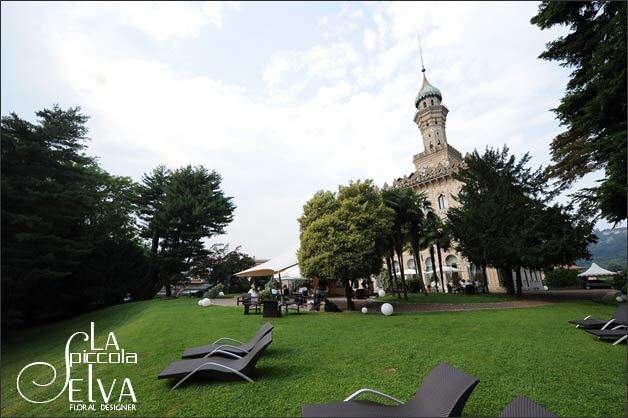 I’m proud to say that La Piccola Selva was part of such a wonderful dream on Lake Orta!